The temple is mentioned in Vishnu Puran, Shrimadbhagwat, Mahabharat, Vaman Puran & Narsingh Puran. Lord Hrishikesh known as Shri Bharatji Maharaj is different from Lord Rama's younger brother Bharat. He is known by the name of Bharat because he is the incarnation of Lord Vishnu in Kaliyuga, the preserving force holding Shankh, Chakra, Gada & Padam in his four hands. It is said that the five Pandavas along with Draupadi visited here on their way to heavan. Having stayed here for some period and performed worship of Lord Hirishikesh Narayan. During the reign of Ashoka, the great (232BC - 276BC), the Boddha religion spread to the hills also. Lord Buddha himself visited here. All the temples of this region were converted into Boddha monasteries. This temple was no exceptiion to this. On excavation, the piece of statue found here is said to be of Lord Buddha. This statue is still is kept under the old Banayan tree before the temple. The four armed idol of Lord Hrishikesh Narayan in the temple signifies that the sage Raibhya conquered over the senses and attained Lord Vishnu. Rahul Sankrityayan has narrated this story in his book Himalaya Parichaya vide page 140. He visited Rishikesh many times and remarked - Rishikesh was a small hemlet of five or ten inhabitants, but now it has surpassed Ayodhya. Just opposite to the main entrance of temple there is an age old tree. Actually it's a combination of three different trees whose roots are intermingled in such a way that it is next to impossible to visaulise them as a separate entity. This include old banayan tree i.e vat virksh, pipal tree and bail tree. All these trees hold a very scared space in Hindu mythology. It is believed that, these three trees represent Tri Dev , Brahama the creator, Vishnu, the preserver and Mahesh the destroyer. Devotees pray these trees with ultimate devotion and belief. A broken buddha statue is kept under this tree which was obtained during the excavation. 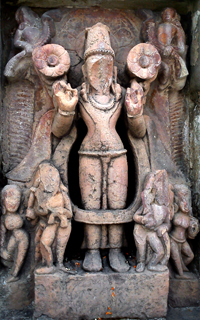 It is believed that this statue dates back to Ashoka period when buddhism was spreading all around the country. 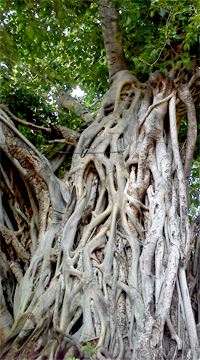 Though the actual age of this tree is not known but it is believed that it is more than twenty five decade old and was there in same condition since the inception of this temple. 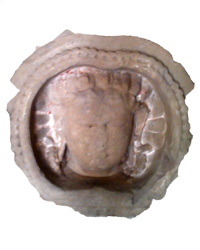 A Museum, containing sculptures, pottery and decorated briks found in the temple premises during excavation, has recently been established in the temple. Museum is duly registered and certified by the Department of Archaelogy Govt. of U.P. The estimated period of these precious objects fall between 3rd century A.D and 14th century A.D. The sculptures of Yaksha, Yakshini, four armed Vishnu, loin figureman with curly hair deserves special mention. 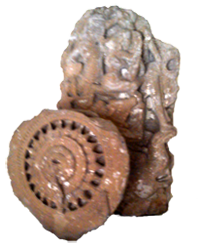 The objective of raising the museum in Rishikesh is to inspire historians and archaeologists for futher study of the area and to acquaint the people with our ancient glorious traditions. 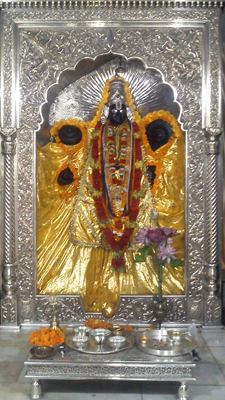 The History of this sacred town is infact the history of Shri Bharat Mandir, a centre of spritual worship and culture. Shri Bharat Mandir holds a very very special place in the history and making of this city called Rishikesh. It's contribution in the development of city is very immense. Once it was the epi-centre of all the activities in the city, even the city's commercial hub was around it. There are many insititutions in the city run by the Bahrat Mandir in the field of education, culture, medicine and social service. It is the only place where city's history is preserved and exhibited. We Rishikeshians are highly indebted to the contribution of Shri Bharat Mandir in the making of city and hope to get the same contribution in the future.